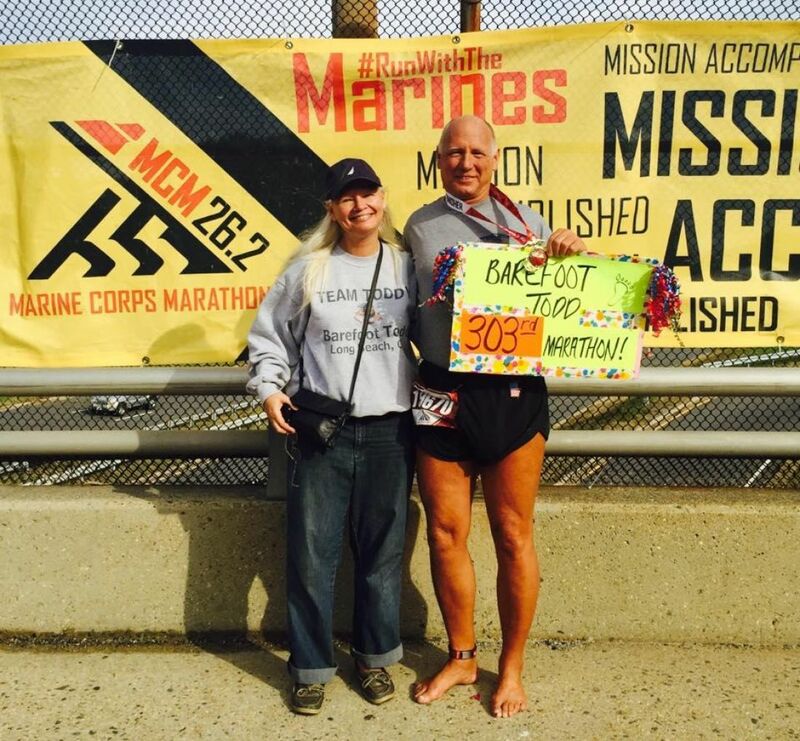 “Disco” will register for his 20th Marine Corps Marathon on March 1 with other members of the MCM Runners Club. Todd Byers plan to run 300 marathons, he was just going to run one back in 1985. After completing his first marathon, Byers fell in love with a feeling. Byers motivated by homesickness and a desire to be with “the good twin” back in Berkley Springs, sought out a “hometown” marathon. The search ended with Byers registered for his first Marine Corps Marathon in 1998. Byers found an interesting way to cover the cost for his trip back to the east coast – forget running shoes and just go barefoot. “I have to find money to pay for the marathon somehow,” he laughed. Byers was so impressed with the MCM that he has continued to participate in the event missing only once in 20 years. The inspiration he felt has allowed Byers to now train others to complete the MCM. A slower pace allows him to enjoy the finer things along the MCM course, like seeing Tina cheering for him at the bridge. Disco and the other members of the MCM Runners Club will enjoy the well-deserved guaranteed access to MCM registration from March 1-14. Membership in the MCM Runners Club is available to individuals who have completed five or more MCMs and must be secured annually by February to be eligible for the current year.